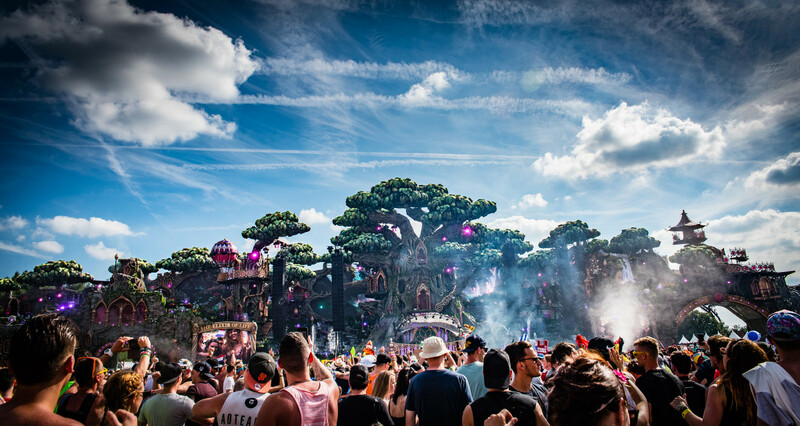 In late July, 65,000 electronic dance music fans from every corner of the globe make the journey to the aptly named town of Boom, Belgium for the world’s most notorious electronic dance music festival, Tomorrowland. 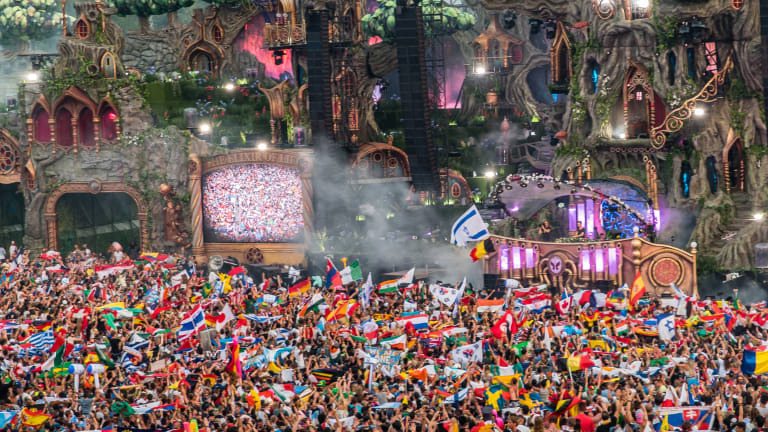 With humble beginnings in 2005 as a smaller event of only 9,000 visitors, Tomorrowland has become the largest international music festival gathering on earth. More than 200 different nationalities from around the globe are represented, with "Global Journey" attendees arriving on 133 flights from 68 different cities, according to Brussels Airlines. Last weekend, I was lucky enough to experience Tomorrowland for the second time, with my photographer and boyfriend Casey by my side. We had and an experience we won&apos;t soon forget. Three days at Tomorrowland is magical, beautiful, chaotic, emotional and blissful all at the same time. It’s difficult and almost impossible to sum up Tomorrowland in words, so I’ve chosen a few of my favorite images that capture the spirit of Tomorrowland. Prepare to be inspired. As if the festivities of Tomorrowland weren’t enough, National Belgium Day took place the day before the festival officially began. It was a national celebration like nothing I’ve ever seen before. 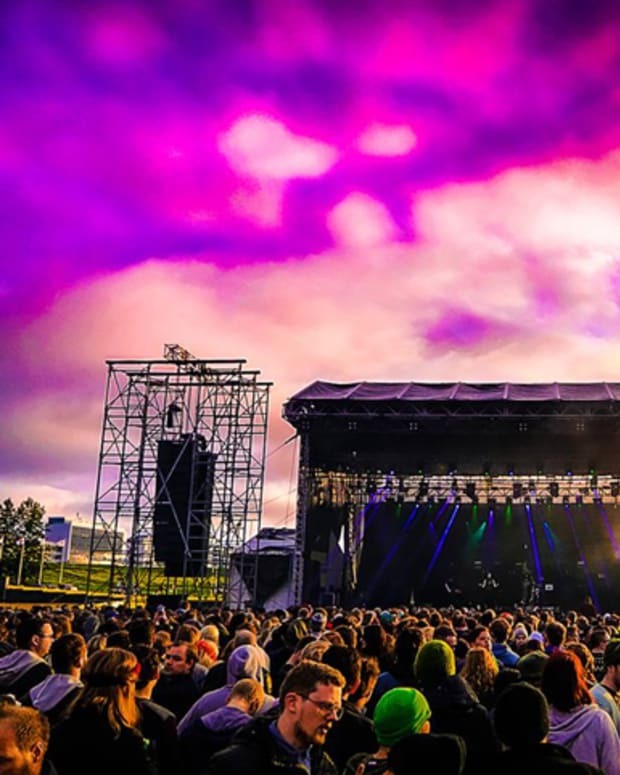 In the heart of Brussels at the Royal Palace among centuries old buildings and sculptures, a Tomorrowland stage was set up with a live DJ for all, festival attendees and tourists alike. It seemed that many people had no idea what was going on or what Tomorrowland even is for that matter, but they were still enthusiastically dancing and bopping their heads along with the crowd. 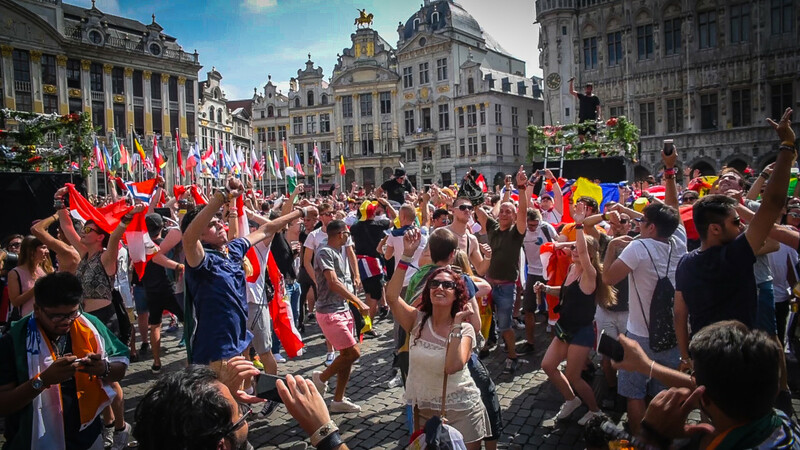 Being that Brussels is the capital of the European Union, it was powerfully inspiring to see the unification of Belgium and Tomorrowland celebrated as one. 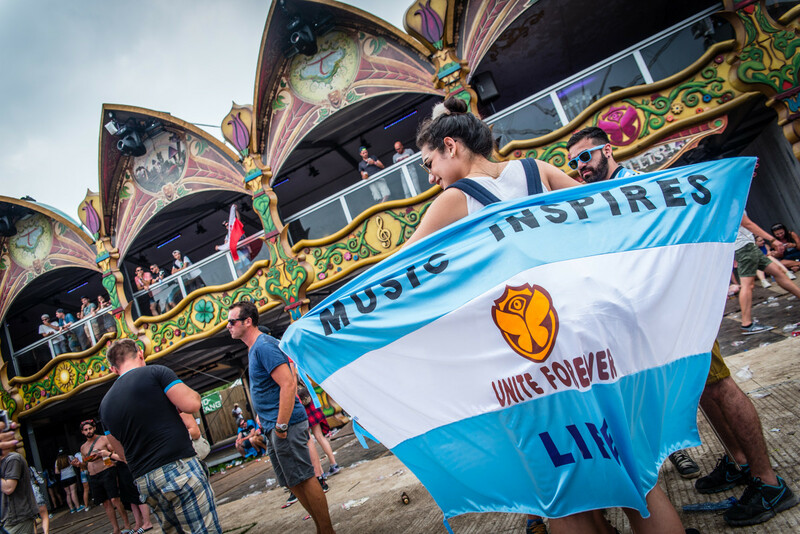 This flag says almost all there needs to be said about Tomorrowland in five words, "MUSIC INSPIRES LIFE; UNITE FOREVER." 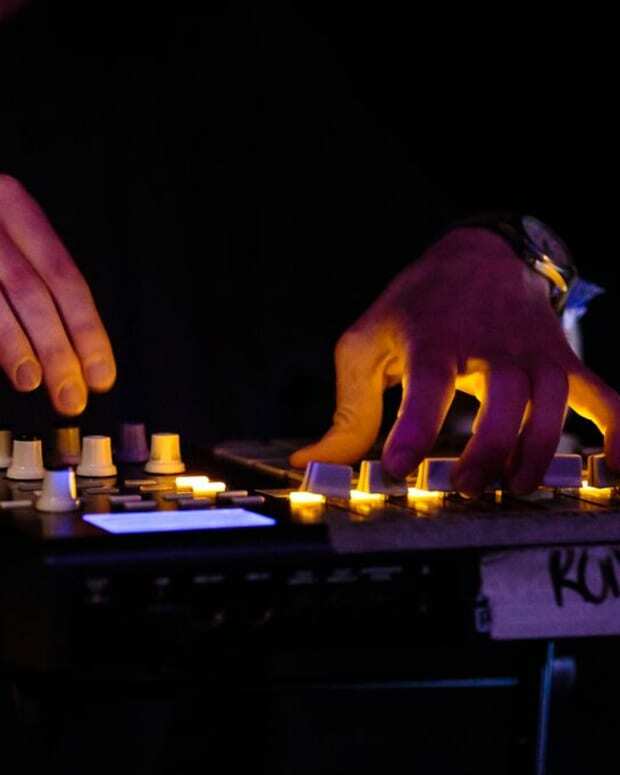 Music is a universal understanding that inspires and unites us in a way that nothing else can. 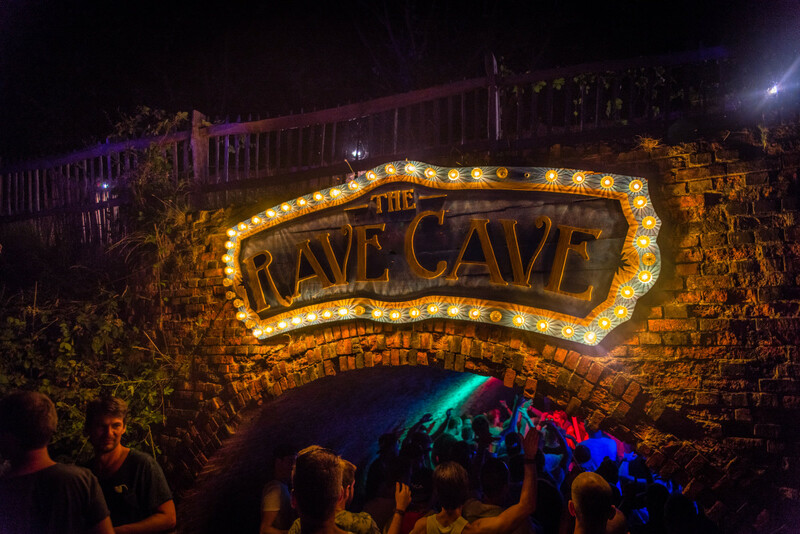 When any of the fourteen other stages at Tomorrowland may get boring, overwhelming or too packed, you can always count on the good ol&apos; Rave Cave to soothe your soul with underground beats and good vibes, transporting you back to the golden days of raving. As always, the level of production at Tomorrowland was top notch, with this year’s theme being “The Elixir Of Life.” As you can see in this widespread shot of the main stage, the attention to detail is impeccable. If you’re lucky enough to get up close to each stage, be prepared to have your mind absolutely blown. Although you get the idea from this image, it still doesn’t do justice for the intricate thought, creativity and beauty that is applied to each stage. 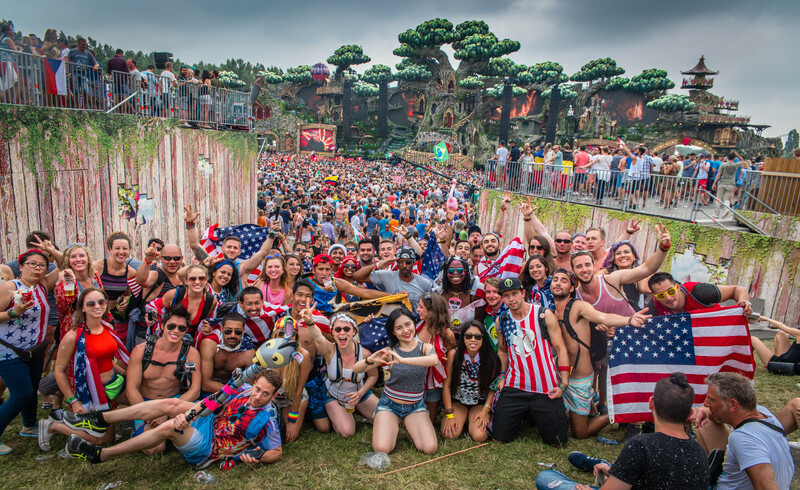 While things seemed to be taking a turn for the worse back home and across the world, USA fans were in full presence at Tomorrowland - aiming to represent the true meaning of what it means to be an American. While the world may be looking down on the millennial generation, we were mingling, bonding and heartily enjoying life with our international friends. As we walked away from the USA meet up, we stumbled upon this proposal taking place. 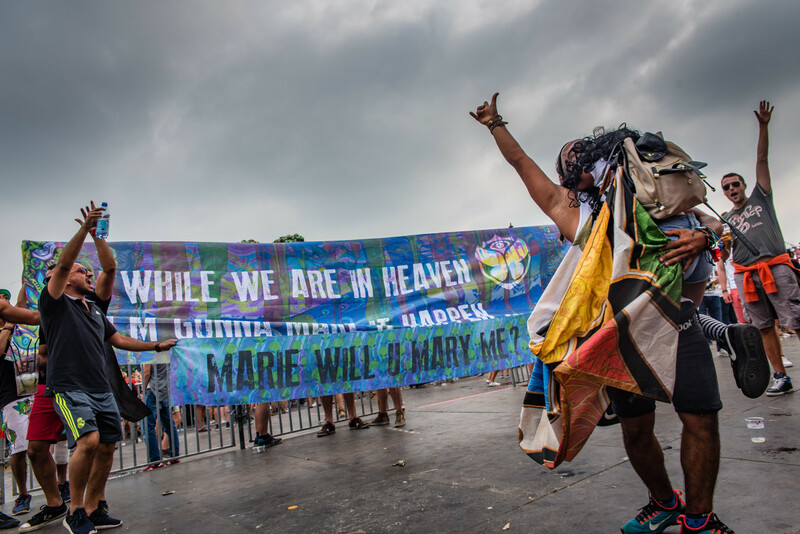 With the proposal words on the banner reading “WHILE WE&apos;RE IN HEAVEN I&apos;M GONNA MAKE IT HAPPEN,” this newly engaged fiancé couldn’t have said it better. Tomorrowland isn’t just another electronic music festival with multiple stages, it’s a utopian land for a weekend where music lovers from around the world gather to co-create peace, love, memories, unity, and most importantly, an idyllic heaven on earth that must be experienced to fully comprehend. 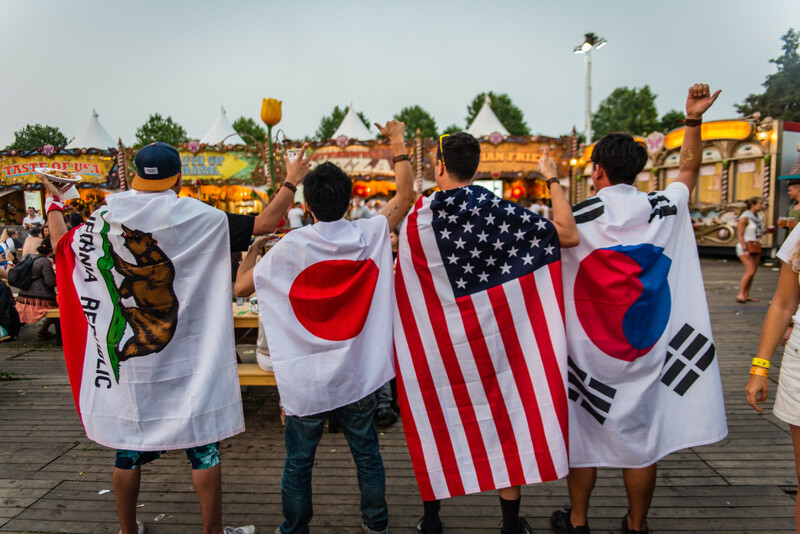 As we wandered through the many available food vendors of Tomorrowland’s "Tastes Of The World," we came across these four friends grubbing while baring their flags in full perspective. As an American and native Californian, I found so much joy in witnessing this image come to life. Two Americans, one Japanese, and a South Korean, just hanging out and eating together at the world’s largest international music festival. It’s said that a picture is worth a thousand words, and this image speaks to every word. 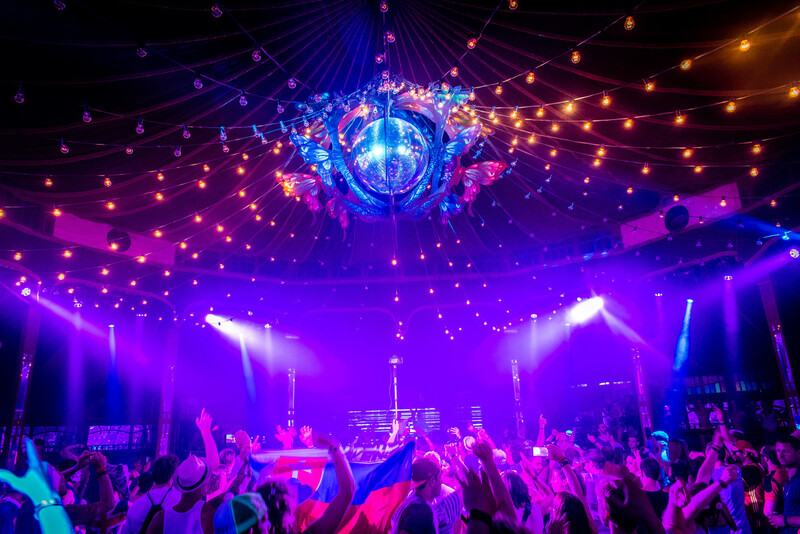 Let’s admire this image of a giant disco ball ornamented in gold flowers at the Magical Mirrors stage, because who doesn’t love giant disco balls, right? Okay, I&apos;ll admit I’m a sucker for just about anything shiny and glittery that gives life to the production of a stage, but if you can’t appreciate the glory of a reflective giant disco ball leading the dance floor as you dance your heart out to the same beat with a room full of strangers, then you just don’t understand Tomorrowland. Whatever your stance is on Israel at the moment, let’s take that out of the equation for just a minute, humor me if you have to. The Israeli flag was the most commonly seen flag on the festival grounds, and to witness this was first hand was quite fascinating. 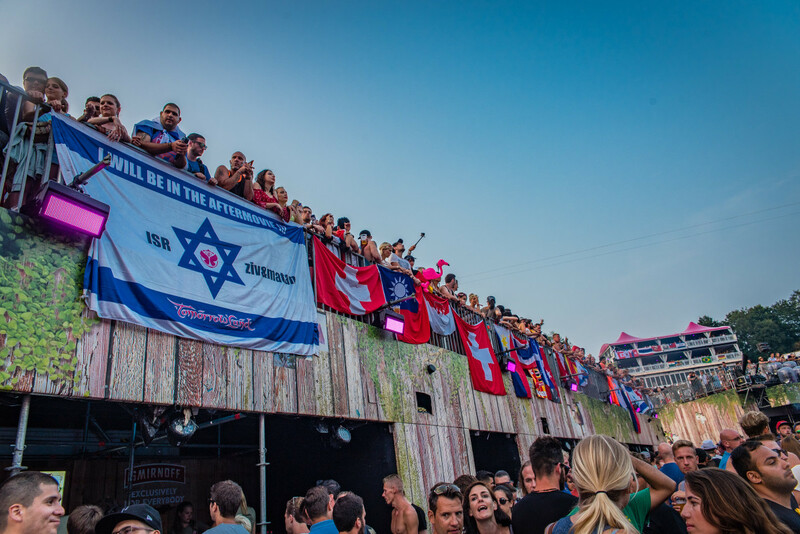 Despite the negative things happening in the world at the moment, Israeli citizens were present dancing, laughing, drinking and most of all, united with people from all over the globe. At Tomorrowland it doesn’t matter if society tries to influence you to dislike or even hate a certain race, sexual orientation, color or nationality, because once you&apos;re a part of the festival, you gain an entirely new understanding of the uniting power of music and what it truly means to be a citizen of the world. 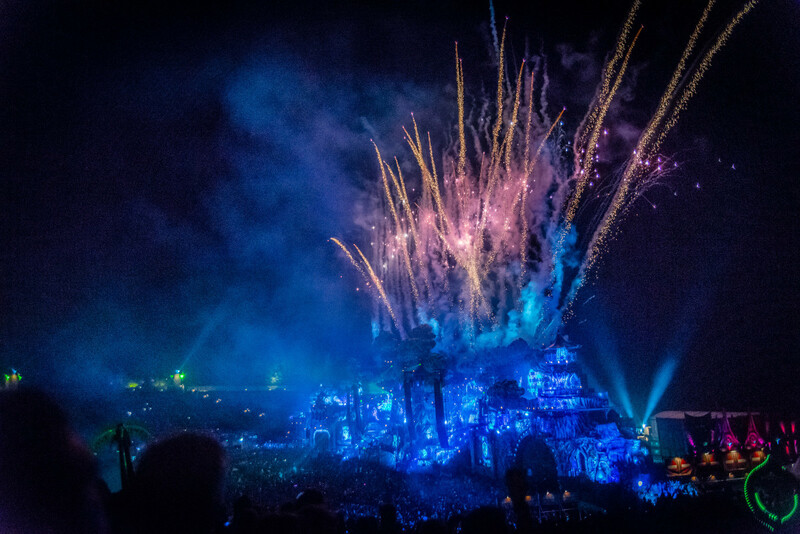 Last but not least, I must give a mention to the spectacular closing of Tomorrowland on the final night. Even if you’re not a fan of the main stage, this is a sight that surely can’t be missed. The entire grass-covered hill is packed to the brim with thousands of people as the collective energy has built up over the entire weekend to these last few defining moments. Flags from every single country represented wave high and proud as extravagant fireworks blast off into the night sky. This is the finale to a brief period of a magical phenomenon which defies space and time, where lifelong memories have been created, perspectives shifted, love found, and peace made possible. These are the people of tomorrow, the future of humanity. "Live Today, Love Tomorrow, Unite Forever." Watch the live coverage of Magnetic Magazine at Tomorrowland here.